Do You Need Customised Cake Toppers and Cake Decorating Stencils? I thought it was time to explain in a little more detail. You may be aware that I am a graphic designer and still maintain my visual branding consultancy ‘by day’, although I do admit deadlines often mean ‘by night’ and weekends too. This has left me short of time to add stencil and cake topper designs to my range. So I am grateful when we get an inquiry for something we don’t currently make as it’s usually a good indication of what event planners and cake decorators are chasing. By asking for ‘skull stencils’ or an ‘Amour’ cake topper, I get an idea of current trends and a catalyst to do something about it! “So what are the restrictions?” you ask. Well there are a few, read on and I will do my best to explain. I’ve had to knock back quite a few requests for stencils of logos. Consider a customer wanting a birthday cake to feature their favourite shoe or football team, brimming with enthusiasm they contact their event planner or cake decorator and excitedly pass on their brief, disregarding the fact that they are asking the decorator to include a logo or graphic that is copyright protected. As such they are asking the cake decorator and in turn the stencil maker to break the law. Our policy on this is clear – we will not infringe copyright laws. One little cake, for one little client, will land us all in hot water! Bear in mind that copyright and other forms of licensing may go beyond logos. For example cake decorators are not at liberty to produce cakes that replicate Disney® characters. Let’s face it, some designs are wonderful in your mind’s eye but don’t always translate well when pen hits paper. As a designer, I know this all too well. An initial thumbnail sketch might show potential, but making it work as a finished design could prove fruitless. In addition, designers are constantly challenged by what we want to produce and what is actually possible to make in the real world. I find it interesting that the mindset for a stencil design is at odds with how the designer (and that would be me) needs to approach a cake topper or indeed a cake stand. Yet there is no cry for sympathy here – I actually LOVE getting my head around these little puzzles! Our pricing is based on a number of elements, one being the amount of time it will take to make the item on our laser. Some designs may be beautiful in their detail but not viable from a cost point of view. As an aside…. 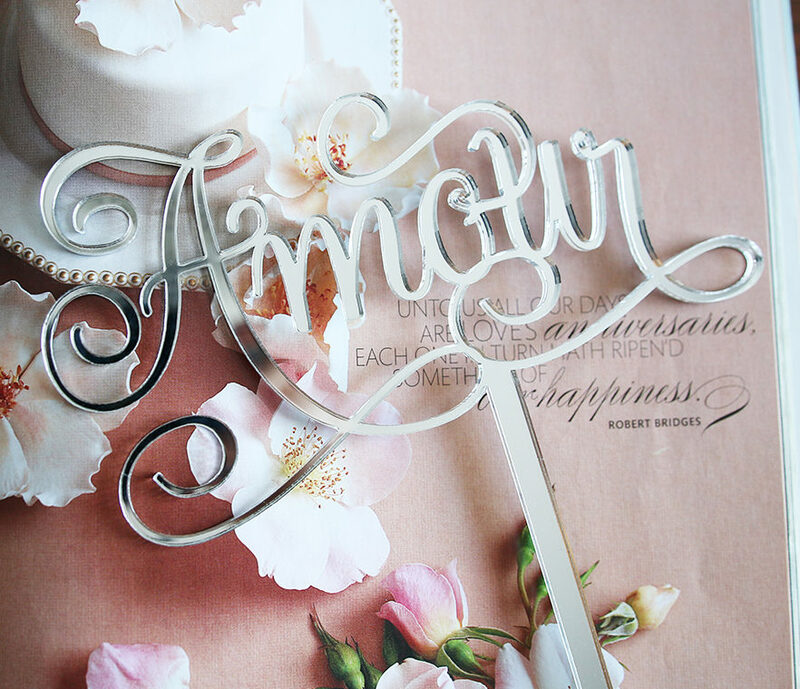 our cake toppers, cake stands and stencils are made individually in our studio in Western Australia. We cannot compete with what some countries charge for laser time or mass production but we have made it our policy at Sandra Dillon Design to add value with quality, design and service. So with these restrictions, is there any point to inquiring about a customised product from Sandra Dillon Design? The answer is absolutely yes! We’ve thought long and hard about this. What can we physically accommodate and what will suit the customer? After all, business is about mutual gain. Most of our requests to date have been for products that will fit our range nicely or are a simple extension to what we currently have, as in the case of a topper. Over the coming weeks, you will notice we have added a few features to our online shop. Many of our toppers will provide a field for customisation, where you can add a name of your choosing or a particular letter or letter combination. This will also apply to a few of our stencils. If you have a request for a stencil or topper design you do not see on our website, feel free to use our contact form. Please make sure to include as many specific details as possible to save us going around in circles in cyber space. The good news for you is…. if we decide your request will be a good fit with our range, we will not charge you the initial drawing up fee (which could be substantial) in an effort to keep your costs down and increase our range of designs. We feel it’s a win/win situation. As I mentioned above your request might provide the catalyst I need and in turn, a perfect designer solution for your next event or cake creation. We do assess each request individually, but assuming it doesn’t involve the restrictions mentioned above and it isn’t obscene – we would love to chat!